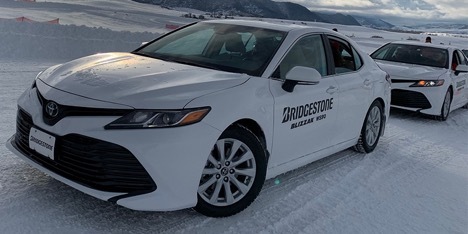 Bridgestone announced the release of a new winter tire, the Bridgestone Blizzak WS90, at their annual Bridgestone Winter Driving School event in Steamboat Springs, Co. The New Blizzak WS90 is a severe weather tire that brings enhanced stopping and stable acceleration, over its predecessor the Bridgestone Blizzak WS80. Possibly the best feature of the new Blizzak WS90, is Bridgestone says it will last an extra winter over the WS80. Who doesn’t want a winter tire that lasts longer and saves money? It will be available in 51 sizes for 86% of the passenger sedans, CUVs and minivans on the road. The new Bridgestone Blizzak WS90 has Multi-Cell technology that means there are millions of microscopic pores on the tires tread to attract water and wick it away from the surface making better grip in harsh winter conditions. With the new Multi-cell technology Bridgestone states that stopping distance improved by 14% on ice compared to leading competitors. The specially designed rubber compounds in the Bridgestone Blizzak WS90 keeps the tire flexible under extremely low temperatures. The flexibility and the tread design work together to create optimized grip for winter driving conditions, making this tire form to the road to maintain traction. This new Bridgestone tire also has the three peak mountain snowflake rating and Nanopro-Technology to ensure flexibility in cold conditions. The durable tire compound offers a 30% more stiffness in the tread pattern. Bridgestone stated that drivers can expect to get an extra winter season out of the new design when compared to the Bridgestone Blizzak WS80. The new enhanced tread design on the Bridgestone Blizzak WS90 has circumferential grooves to help channel water and slush out of the footprint area to reduce hydroplaning. The large shoulder blocks offer great stability and control when cornering. The variety of side designs are engineered to work together to enhance winter and wet performance. The Bridgestone Blizzak WS90 has interlocking sipes and 3-D sipes providing more edges for enhanced snow and wet performance and handling. The zigzag sipes improves the snow and ice traction while the center multi-z improves draining. 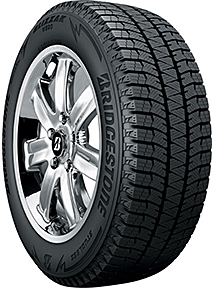 The Bridgestone Blizzak WS90 should be available to customers in Spring 2019. Tires-Easy has been a trusted supplier of quality, new tires online to customers since 2004. We pride ourselves in having the best selection of quality new tires and an extensive knowledge center to aid our customers in the tire buying process. We have a great selection of Bridgestone tires for car, trucks, SUV and CUVs. Finding your tires just got easier at tires-easy.com.